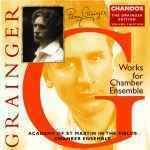 CD: Works for chamber ensemble. Recorded/performed at: Potton, Hall, Dunwich, Suffolk, England, on May 98. Percy Grainger Robert Smissen 3 mins, 8 sec. Recorded/performed at: Potton, Hall, Dunwich, Suffolk, England, on May 98. Percy Grainger Kenneth Sillito, Stephen Orton, Hamish Milne 6 mins, 2 sec. Recorded/performed at: Potton, Hall, Dunwich, Suffolk, England, on May 98. Percy Grainger Kenneth Sillito, Stephen Orton, Hamish Milne 4 mins, 17 sec. Recorded/performed at: Potton, Hall, Dunwich, Suffolk, England, on May 98. Percy Grainger Kenneth Sillito, Stephen Orton, Hamish Milne 2 mins, 40 sec. Recorded/performed at: Potton, Hall, Dunwich, Suffolk, England, on May 98. Percy Grainger Stephen Orton, Hamish Milne 15 mins, 51 sec. Recorded/performed at: Potton, Hall, Dunwich, Suffolk, England, on May 98. Percy Grainger Kenneth Sillito, Hamish Milne 3 mins, 27 sec. Recorded/performed at: Potton, Hall, Dunwich, Suffolk, England, on May 98. Percy Grainger Kenneth Sillito, Hamish Milne 3 mins, 37 sec. Recorded/performed at: Potton, Hall, Dunwich, Suffolk, England, on May 98. Percy Grainger Kenneth Sillito, Stephen Orton, Hamish Milne 4 mins, 57 sec. Recorded/performed at: Potton, Hall, Dunwich, Suffolk, England, on May 98. Percy Grainger Kenneth Sillito, Stephen Orton, Hamish Milne 3 mins, 31 sec. Recorded/performed at: Potton, Hall, Dunwich, Suffolk, England, on May 98. Percy Grainger Kenneth Sillito, Stephen Orton, Hamish Milne 2 mins, 6 sec. Recorded/performed at: Potton, Hall, Dunwich, Suffolk, England, on May 98. Percy Grainger Stephen Orton, Hamish Milne 3 mins, 18 sec. Recorded/performed at: Potton, Hall, Dunwich, Suffolk, England, on May 98. Percy Grainger Kenneth Sillito, Hamish Milne 3 mins, 40 sec. Recorded/performed at: Potton, Hall, Dunwich, Suffolk, England, on May 98. Percy Grainger Kenneth Sillito, Malcolm Latchem, Robert Smissen, Stephen Orton 8 mins, 53 sec. Recorded/performed at: Potton, Hall, Dunwich, Suffolk, England, on May 98. Percy Grainger Stephen Orton, Hamish Milne 5 mins, 4 sec. This product forms part of the following series: Grainger Edition (volume 13). Capture session: recorded at Potton Hall, Dunwich, 2-4 May 1998. Liner notes include programme notes (in English, German and French). Performers: Academy of St Martin in the Fields Chamber Ensemble ; Kenneth Sillito (violin) ; Malcolm Latchem (violin) ; Robert Smissen (viola) ; Stephen Orton (violoncello) ; Hamish Milne (piano). Score: Tone-stuffs for brass five-some / Percy Aldridge Grainger ; arranged by David Stanhope. Score: Arrival platform humlet / Percy Aldridge Grainger. Score: Shepherd's hey : for 2 pianos 4 hands / by Percy Aldridge Grainger.